The ruined old city of Ayutthaya is situated only around 80 kilometers (50 miles) directly north of Bangkok, making this a very worthwhile day trip from the Thai capital. This ancient city, once known as the Venice of the East, was the former capital of the Phra Nakhon Si Ayutthaya province, and the second capital of Siam. Today this beautiful city is a UNESCO World Heritage Site with its ruins protected within the Ayutthaya Historical Park. Although in ruins, the city is intact enough to get a sense for the grandeur of the former capital, with its characteristic prangs (reliquary towers) rising up from its temples, and its large Buddha statues. This is one Thailand attraction you should not miss! Being located so close to Bangkok makes Ayutthaya relatively easy to get to. There are several different options for travel from Bangkok to Ayutthaya, including car, minivan, bus and train. Backpackers talking to a taxi driver in Bangkok. © 2p2play / Shutterstock, Inc. The direct journey by road from Bangkok to Ayutthaya only takes around an hour so if you’re looking for a quick escape from the bustling city and the convenience of door-to-door service, a private car or taxi is your best bet. You can rent a car from the city or from one of Bangkok’s two airports, and if you’re traveling with a couple of friends or family and are planning to go elsewhere, a rental car could be a good choice. Taxis are also a good choice if you want to sit back and not have to worry about finding your way. It’s a good idea to agree on a price before you leave, and an even better idea to have your hotel organize the taxi and agree on a price for you. Train on the way from Bangkok to Ayutthaya. © Akenakub / Shutterstock, Inc. 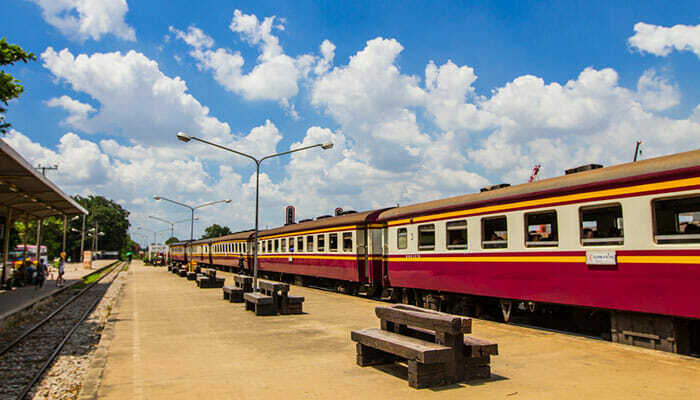 Many travelers who have taken the trip from Bangkok to Ayutthaya will tell you that the train is by far the best way to go, and we can’t disagree! Not only is the train the cheapest option, it is also the most scenic, however it’s not the quickest way. Trains in Thailand are notoriously slow but the 2 hour journey does give you the chance to sit back and enjoy the scenery as you amble past. Trains depart from Bangkok’s Hua Lamphong Station, which you can reach via the MRT, and they leave regularly throughout the day. Delays are quite common so if you do take the train, be prepared to go with the flow and expect it to take a while. You cannot beat the train for affordability though. You can buy a third class ticket for around 15 Baht or get a little more comfort and a designated seat by choosing first or second class. When buying your ticket at the station, be sure to head directly for the ticket booths and only buy your ticket and ask any questions you might have there. This is because there are frequently people posing as station personnel when you enter the station, even going so far as to wearing official looking uniforms, who will try to get you to use alternate modes of transport or convince you that the train is not running. Just ignore these people and you will be fine! Another advantage with the trains to Ayutthaya is that they do have some facilities and services onboard. You can buy drinks and snacks, and there is a toilet (albeit not the nicest toilet you’ve ever seen!). Minivans at Mo Chit Bus Station Bangkok. © hayachanta / Shutterstock, Inc. The Ayutthaya minivan leaves from Mo Chit Bus Station in Bangkok and is another affordable alternative to get you to this great city. The minivans are quite new and well maintained so comfort levels are good (better than public buses) and it’s a nicer way to get to know some fellow travelers. The way these usually work is that they will not depart until they are full, so if it’s a quiet day you may have to wait a little while, however, this usually is not a problem! 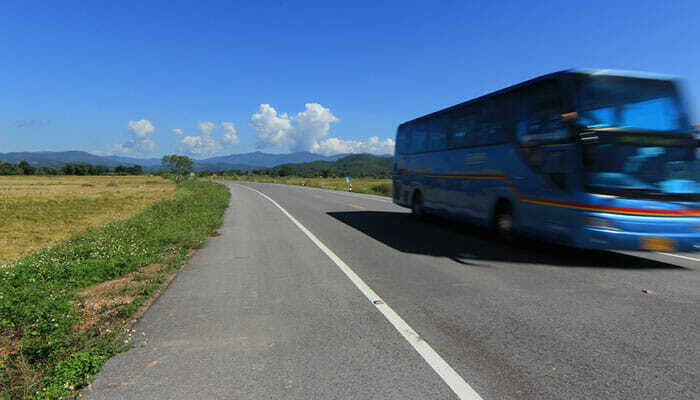 The minivan to Ayutthaya is not direct, meaning it will stop at a number of places along the way, but, there are far fewer stops than on a regular public bus so it’s still faster. Plan on the journey taking somewhere around an hour and be sure to stay on the minivan until the end of the route which is close to Wat Mahathat, at Naresuan Alley. If you’re hoping to save money on the cost of the minivan service then the public bus is another option. 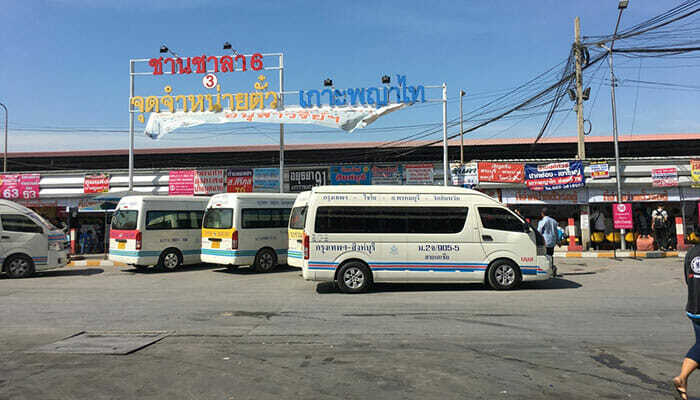 Buses do leave frequently from Bangkok to Ayutthaya so you should not have to wait long at the Northern Bus Terminal for the next bus to depart. Where you save on cost you will sacrifice a little comfort and time because the public buses make many stops along the way resulting in a longer journey time of anywhere between 1 and 2 hours. So, there are the main ways to travel from Bangkok to Ayutthaya. As with most destinations you can make a decision based on your budget and any time constraints you might have, but, given the choice, our recommendation would be to take the train to Ayutthaya because it’s the cheapest, comfort levels are good, there are services onboard, and you get to enjoy the scenery.